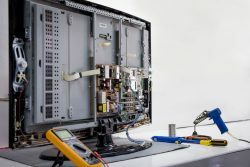 Since 1984, BAS Electronics TV & Electronics Video Repair has provided electronic repair services to customers throughout the St. Charles, MO area. We are a family-owned and operated business with over 30 years of experience repairing TVs, VCRs and DVD players, monitors, computers and more. We also responsibly recycle unwanted electronics. Our friendly professionals work hard to provide quality repairs at reasonable prices. Call us today! Being able to jam out to your favorite CDs or watch your football team battle it out on the field every Sunday are the simple joys of life. If you’ve got a stereo that’s not working or a TV that’s giving you trouble, it’s hard to enjoy these things! Before you junk your electronics, consider bringing them to BAS Electronics TV & Electronics Video Repair for electronics repair in St. Charles, MO. We’ll do our best to get them working right again. No matter the brand or the problem you’re experiencing, we’ve got the technical know-how to fix things. When it comes to TVs, DVD players, VCRs, stereos, monitors and computers, we’re the authority on delivering repairs! Sometimes, it’s just time to move on. If your TV is fried or your DVD player has met the end of its life, electronics recycling in St. Charles, MO is the way to go. We’re your resource for that too! We’ll safely disassemble and recycle most electronics* to help you avoid having to dispose of them yourself. Some recycling centers charge disposal fees—we don’t! We’ll take your defunct item off your hands so you can focus your search on getting something newer and better. Don’t settle for damaged electronics or pay huge fees to buy new ones when you could visit BAS Electronics TV & Electronics Video Repair to get your defective items repaired! Contact us today and let us provide you with an affordable quote on quality repairs. *Please note, we do not take CRT (tube) TVs. We make it easy for customers to drop off their electronics and pick them up later. All repairs are done in-house, meaning we’re the only ones handling your items. Our electronics repair experience goes back 30 years, giving us the ability to repair old and new products alike—from old VCRs to modern LCD computer monitors. We recycle your old, unwanted electronics the right way, breaking them down to dispose of parts separately to avoid unnecessary fees. We offer quotes on all repairs and make sure to give you a complete quote that includes all fees for parts. You won’t find any hidden costs here! Our business proudly maintains an A-plus rating with the Better Business Bureau (BBB) and a reputation for exceptional customer service. If you’ve got a TV, stereo or other electronic that needs repairs or is ready to be recycled, bring it to us! We promise quick repairs and responsible recycling, with affordable rates on everything!